Biscuits are one of the simplest quick breads you can make. A plain biscuit is nothing but flour, butter, milk, baking powder, and salt. The perfect biscuits should be light and airy, fluffy and flaky, and have an outer crust with a satisfying bite. To achieve these aims, you'll need to use the right technique. Once you know how to do that, making biscuits will be both simple and easy. To begin with, biscuits are made from flour. So the first thing you want to think about is what kind of flour to use. Cake flour will give you a lighter, fluffier biscuit, but the outer crust won't have as much bite to it. Conversely, all-purpose flour will provide more bite, but it'll be a drier, less airy biscuit. The solution: Use half cake flour and half all-purpose flour. This combination will give you a biscuit with light and airy interior with a pleasant, satisfying bite on the outside. Also, sifting the flour and other dry ingredients will give you a smoother, airier dough. You don't even need a flour sifter to do this. A wire mesh strainer will work just fine. Once you add the liquid, whether it's milk, buttermilk or whatever, it's important to remember that the more you mix the dough, the more you exercise the gluten in the flour, which in turn makes the final product tougher. (This isn't just the case for biscuits, it's true for anything you bake with flour.) Therefore, you want to mix the dough just until the wet and dry ingredients are combined and no longer. The same goes for kneading and rolling out the dough. The more you work it, the tougher it's going to get. Additionally, in order to roll out the dough out and not have it stick to your rolling pin and whatever surface you're rolling them on, you're going to have to dust everything with extra flour. This extra flour, in turn, dries out the dough and makes a tougher biscuit. Moreover, if you roll out the dough and then use pastry cutters to cut out round biscuits, you're going to end up with extra scraps of dough. You don't want to throw these scraps away, so you simply reroll them and cut out more biscuits, and so on, until you've used it all. The only trouble is, the more times you reroll the dough, the tougher it's going to get. That very last biscuit you make is going to be very odd indeed. Now, maybe you don't mind this, and if that's the case, you don't have a problem. But if you really want the lightest, flakiest biscuit possible, the best way to form the biscuits is by hand. Just gently shape them into little balls and transfer them to a baking sheet. They'll bake up into the tenderest, flakiest biscuits you ever had. And it's faster, too. No rolling, cutting, rerolling, and so on. You just roll the dough into balls until there's no more dough left, and then you bake them. That's all there is to it. Now let's talk about the fat. What makes a biscuit flaky is the fat, specifically, how the fat is incorporated into the flour. In terms of flakiness, the best fat for making biscuits is probably lard, and vegetable shortening is the next best. In terms of flavor, however, butter is undoubtedly the best, with lard a close second. On the other hand, biscuits made with butter or lard won't keep as long as ones made with shortening—but this shouldn't really be an issue as the biscuits you make using this technique will be so delicious, they're going to get eaten really quickly. In any event, our first choice is butter. To ensure maximum flakiness, you want to make sure you use cold butter. In fact, it's not a bad idea to chill everything—the flour, the butter, the milk, even the bowl you mix it all up in. Colder butter will produce globules of fat that stay separate from the flour, which is what makes a biscuit flaky. The bigger the globules, the flakier the biscuit. So, what's the best way of incorporating the fat into the biscuit? The basic technique is something called cutting in the fat, in which a pair of knives or a special tool called a pastry blender is used to literally cut cubes of fat into the flour, forming a lumpy, mealy consistency. Some bakers do this by hand, by rubbing the lumps of fat into the flour. The problem here is you have to be really fast. If you're not extremely skilled, your hands will end up just warming up the lumps of butter and your biscuits won't turn out right. A pastry blender works well, and so does a food processor. That's right: the easiest and quickest method of all is simply to put the flour in a food processor, add the butter and just give it eight or ten short pulses until the fat is incorporated. As we mentioned at the start, the basic biscuit recipe is very simple indeed. But you can vary the recipe in any number of ways, and one of the classic variations on biscuits is to use buttermilk in place of regular milk. Buttermilk will add a rich, tangy flavor to the biscuits, and the acid in the buttermilk will react with the baking powder, thereby giving the biscuits more rise. You can also make biscuits with plain yogurt instead of milk. Or add grated cheddar cheese or chopped herbs. 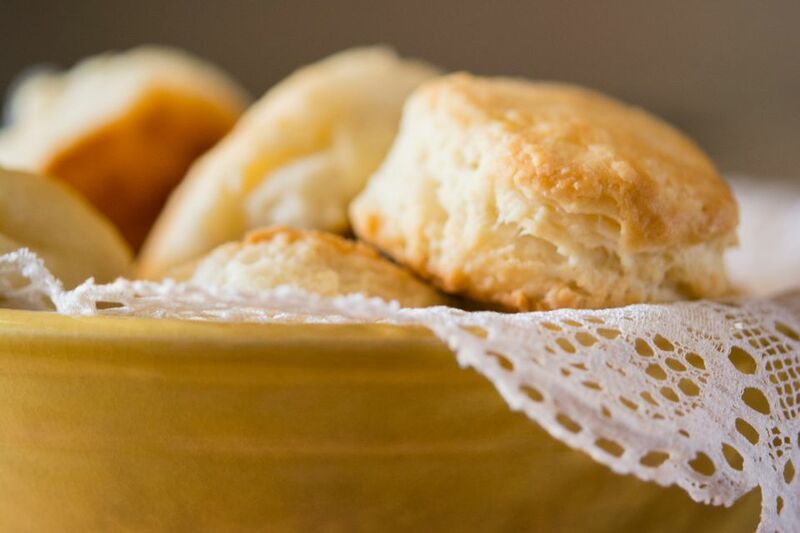 Here's a simple biscuit recipe to get you started.